Reformations in music are risky business you know. In some cases you have the likes of Dinosaur Jr, My Bloody Valentine and The Pop Group who are continuing to tear it up through live performances and superb new material but then on the other side of the spectrum you have the likes of (sadly) Smashing Pumpkins and Pixies, who maybe aren’t feeling quite as electric as they did all those years ago. The most gutting one for me is New Kids On The Block; so much potential wasted. Anyway the latest band to add this pile are The Libertines, who after ten years have knocked their heads together to start performing live again and to also release their new studio album Anthems for Doomed Youth. I saw these guys at Reading Festival last month and they kicked arse dude, so I was hyped for this new record. What made The Libertines such an anomaly at the time was their volatile attitude and steadily imploding band member dynamic. The limelight was shared by two frontman in the form of Pete Doherty and Carl Barat who remain very talented musicians today, and much like J Mascis and Lou Barlow maintained a very shaky relationship over the years. Eventually Doherty’s love of drugs spiralled out of control and the tension became too much and the band decided to end things, bringing the end to one of the most exciting bands in mainstream music at the time. Fortunately in their ashes did bring out the likes of Arctic Monkeys and The Cribs and The Fratellis and The View and Kaiser Chiefs which signalled somewhat of a renaissance in Indie music. Nowadays it seems all the hatchets have been buried as The Libertines return to their joint writing venture for Anthems for Doomed Youth, and the cooperation is just as strong as ever. Throughout this record Doherty and Barat share vocal duties and guitar solos and melodies and all sorts of noises, showing that their artistic chemistry is really rather good. Barbarians kicks things off with a sound that’s modern and not ten years old, as nice indie chords are strum with a gusto that only The Libertines could bring. This makes way for the lead single Gunga Din, which features a very laid back instrumental made even better by the lead riff which envelops the airwaves into the indie times of old. The track is catchy and full of swear words and a crashing finale full of energy which could have made the likes of Vertigo, Can’t Stand Me Now and Horrorshow blush. Awesome track. Unfortunately for a band who were hailed as delivering intense energetic performances and material full of attitude it seems they’ve kinda forgotten about it on Anthems for Doomed Youth. Most of the material featured offers a more acoustic approach to The Libertines without thinking about shouting out for offering something ballsier. So while tracks such as You’re My Waterloo are wonderful little tunes complete with excellent lyrics and powerful piano chords and licks it does leave other cuts like Belly Of The Beast and Iceman to fall a little bit flat. 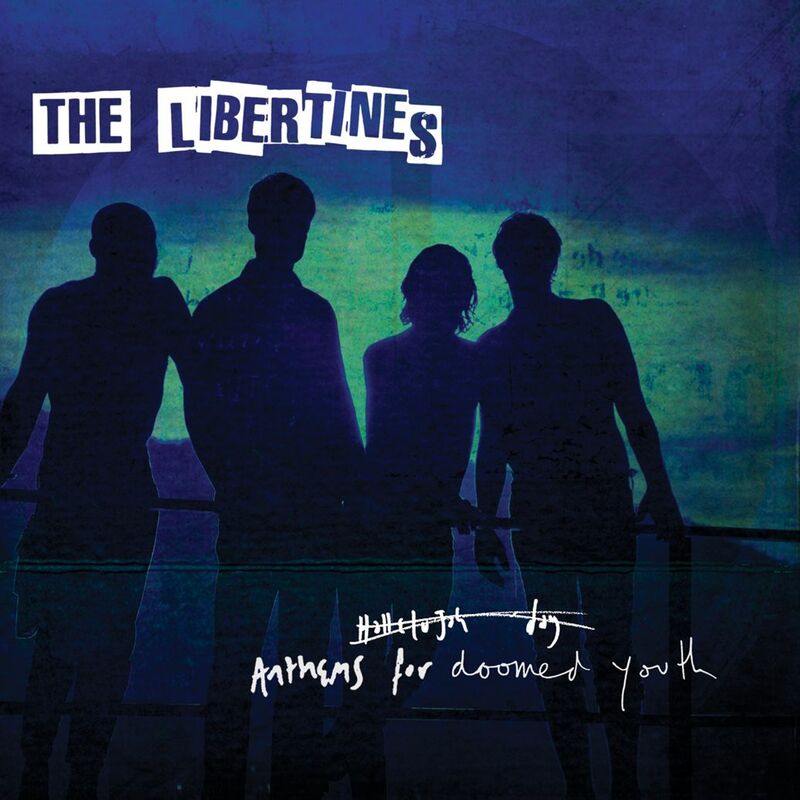 Anthems for Doomed Youth is a solid album from The Libertines, which is all we could really ask for. Nobody expected them to perform live let alone produce new material, and fortunately most of that material is good. You’re My Waterloo might be one of the best songs they’ve ever done, and Gunga Din is a good single, and yeah, nice one Libertines. Welcome back. For more music reviews, free downloads and interviews check out Exploding Head Syndrome on Facebook and Twitter.